A note of intro. 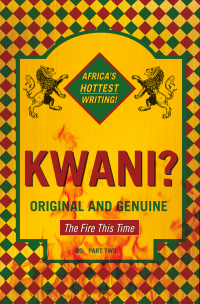 from Africa in Words: Last year we took part in ‘Blogging the Caine Prize’ – a carnival of week-by-week blogging around the shortlist for the annual Caine Prize for African writing. While there is no ‘organised’ carnival going on this year, the prize continues to showcase some fantastic writing and we – Kate and Katie – still wanted to be part of conversations about it. From this Friday onwards we will be sharing a review or comment piece each week on one of the 5 shortlisted short stories, by different contributors, some regular, some new. Inspired by the reviews on Brittle Paper we will post our own in the same order, beginning with Billy Kahora’s The Gorilla’s Apprentice (reviewed here by our very own Rachel Knighton). The stories are all available to download and read for free on the Caine Prize website. Have a look, read our reviews and let us know what you think. Billy Kahora’s ‘The Gorilla’s Apprentice’ is an evocative story that centres on an unlikely friendship between soon-to-be eighteen year-old Jimmy Gikonyo and Sebastian, an ancient mountain gorilla from Nairobi’s Animal Orphanage. Set amidst the turbulence of the violence that followed Kenya’s 2007 election, this is a story that speaks to the traumas of that moment. Kahora is particularly effective in conveying the sense of crisis that permeated Nairobi during this time. To readers unfamiliar with Kenya’s political history, the significance of the weighted first words of the story – ‘That last Sunday of 2007’ – becomes apparent as the narrative progresses. The impending violence sparked by Kenya’s December elections haunts Jimmy’s meeting with Sebastian in his secluded hideout at the animal sanctuary. ‘Their interaction’, Kahora writes, ‘was now defined by that strange sense of inevitable nostalgia that death brings’. Nairobi’s descent into violence is paralleled with the pathos of Sebastian’s imminent death. Kahora’s sustained engagement with Kenya’s post-election violence can be seen in his work with Kwani? and specifically his editing of Kwani? 05, a journal based on the aftermath of the 2007 elections, and the visual narrative Kenya Burning. Kahora’s concern for the gorilla carries further symbolic weight. 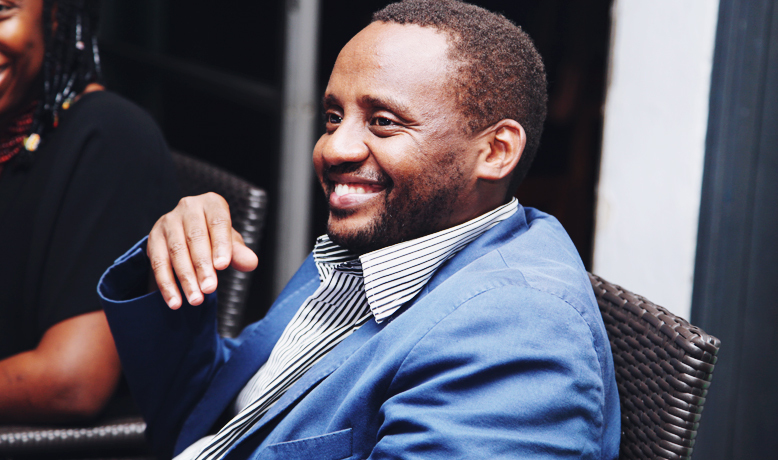 Sebastian, ‘Saved from the Near Extinction of His Species After the Genocide in Rwanda’, provides a direct link between the Rwandan genocide and the events taking place in Kenya. Sebastian’s relocation to Nairobi transposes a sense of the sorrow, injustice, and sheer scale of violence that took place in Rwanda onto its East African counterpart. 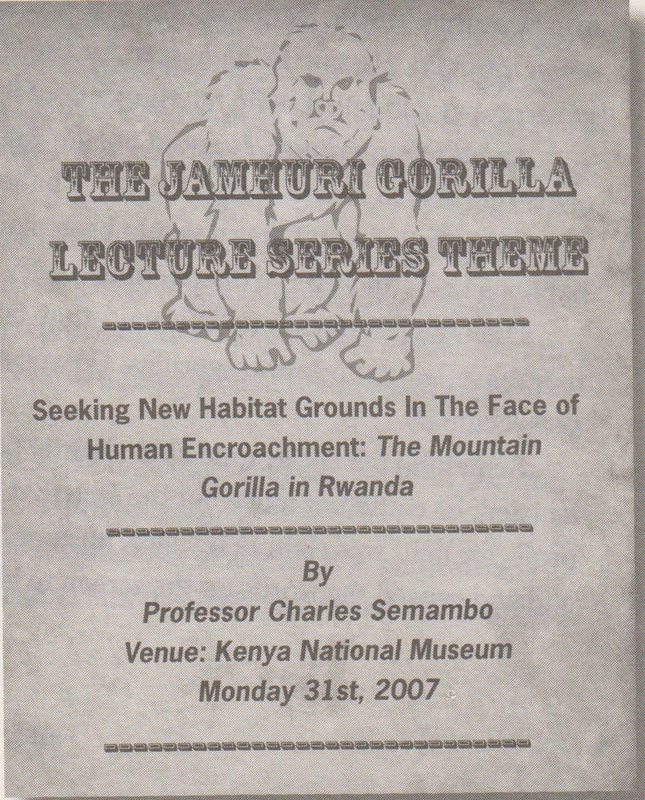 The connection between Rwanda and Kenya comes to the fore through the mysterious character of ‘the gorilla-talking man’ or Professor Charles Semambo. Appearing at Sebastian’s cage as ‘[a] dark tall man’ wearing ‘dark glasses’, we learn of Semambo’s true identity and the reasons for his ability to speak to Sebastian. Semambo’s provenance is unambiguous. Coming to Kenya in 1994 to make a new life after the genocide, Semambo guides the young Jimmy through this experience of death. Together, they view the disturbing scenes of ‘black smoke billowing towards the City Centre’ and the ‘figures that danced in the road, yelling and waving pangas, grotesque in the firelight’. Semambo’s comments on the dying Sebastian are strange and apocalyptic, yet poignantly highlight the destruction of innocence that is a major theme of the text. ‘Can you imagine’, Semambo asks of Jimmy, ‘what Sebastian has seen of man since he was born?’. Sebastian’s painful history is cleverly paralleled with Jimmy’s fragile youth and the remarkable strength of his resilience as he reaches the brink of adulthood. The pair’s communion, ‘their dance, [the] small mimicking movements they shared’ connotes a mutual escapism and empathy; a shared sense of loss at the decay and decomposition of life outside the refuge of the animal orphanage. Kahora’s ability to write these inferences and the movement of his narrative between people, places and experiences is a remarkable feature of his writing. He shifts, for instance, from Jimmy’s visit to the Nairobi Orphanage to his childhood and the challenges faced by both the departure of his father and his period of illness at twelve years old. Kahora’s portrait of Jimmy’s mother, Claire, and the dilapidated flat in Kileleshwa where they live is another example. The ‘chemical haze of her dressing table’ and the whisky that she regularly consumes are pictured as contributing to the toxicity of Jimmy’s home-life, his ‘Real Life’. Indeed, Kahora’s writing of the domestic is particularly striking. His detailed description of the inside of their flat, crammed full of imported electrical appliances such as ‘the Cheng TV, the Fong music stereo’, conveys the cloying, oppressive environment of a typically middle-class urban family. Kahora’s mapping of Nairobi serves a similar purpose. Tracing Jimmy’s journey ‘from the National Museum to Kileleshwa through Waiyaki Way, then Riverside Drive’, Kahora’s story is firmly dedicated to recreating the specific locale of a Nairobi suburb. His concern for the ‘ugly aspirations and clutchings’ of Kileleshwa, its ‘tall ice-cream cake apartment buildings that crumbled like Dubai chrome furniture after a few years’ demands the critical question: what has happened to contemporary Kenya? ‘The Gorilla’s Apprentice’ is, in this way, distinctly political. It addresses the climate of the 2007 post-election violence whilst also pointing to the myriad of other, more undercover social problems impacting Kenya today. Kahora juxtaposes, for example, the poverty of ‘the corn-cob life, meals on a three-stoned hearth’ in Kerugoya town, against the ‘foreign tourists’ carrying their copies of ‘Lonely Planet Kenya’ around the animal sanctuary in Nairobi. He also draws attention to the neo-colonial, hierarchical structures of power operating within the country. The character of Baker, ‘the museum co-ordinator’ and ‘naturalized citizen’, is pictured as providing ‘international legitimacy to the thugs who ran the government’ through his position as ‘a middleman between a defaulting government and donors’. Kahora’s short story is, however, ultimately literary and above all elegiac. His evocative descriptions of the animals in the sanctuary demonstrate his craft as a writer as well as his ability to affect the reader into a state of empathy and mourning at the events of 2007. The ‘magenta, indigo and turquoise noises fluttering in th[e] throats’ of exotic ‘parrot, ibis, egret’, turn into ‘faraway screams [that] rent the air’, causing ‘gazelles and impalas [to] sto[p] grazing and loo[k] up in their wary way’. The uncertainty of the story’s climax and the its troubled ending attest to the complexity and intensity of this text, making it, in my view, a strong contender and a worthy candidate for the Caine Prize 2014. Africa in Words will be sharing a review or comment piece each week on one of the 5 Caine Prize shortlisted short stories. The stories are all available to download and read for free on the Caine Prize website. Read The Gorilla’s Apprentice HERE. Read next week’s story, “Phosphorescence” by Diane Awerbuck HERE. I just read and am posting on this story. I liked and agree with your comments about the symbolic importance of Sebastian. Kahora did a good job of bringing the urban chaos of Niarobi to life. I preferred this story to his 2012 short listed work “Urban Planning “.